One of the most evocative venues in motorsport history, the Nurburgring has changed a lot from its original layout, created in the 1920s as much as a proving ground for the German motor industry as for racing. Carving through the forests of the Eifel mountains, the 14.2 mile Nordschleife circuit featured more than 170 turns, rose and fell more than 1,000 feet over the course of a lap, and had blind crests that sent cars airborne. The Nordschleife hosted the Formula One German Grand Prix 34 times until 1976, when the final race was marred by a serious crash involving Niki Lauda. 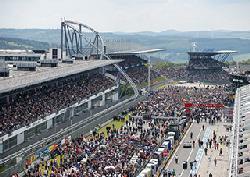 After minor changes, it hosted endurance races, including the Nurburgring 1,000km, and the lap record of 6min 11.1s for the final version of the old circuit is still held by a sports car, Stefan Bellof's Porsche 956 in 1983. The new circuit opened in 1984 and was extended in 2002. A more modest 3.2 miles, with just 17 turns, it remains popular with current F1 drivers, many of whom have said it retains at least something of the character of the classic "Green Hell". 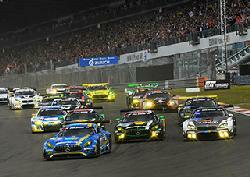 2017 will see the 45th running of the 24 hours race at the Nurburgring. The race combines both the Nordschleife and the Grand Prix circuit laptimes for the really quick GT2 and GT3 cars are well under 9 minutes - and viewing opportunities are excellent. The spectator areas are mini-villages, with six-foot fire pits, impromptu sofa grandstands and reservoirs of kegged lager; while behind the wheel drivers take on the most daunting of tracks. The place is unique, magical, raw, dangerous and seriously fun, day and night; it is a music festival-meets-Oktoberfest-drinking-meets-camping-extravaganza. In the pit lane there is a sporting spirit that comes from another age, perhaps because works teams are shoulder to shoulder with privately-run track specialists. There is also the tremendous manufacturer rivalry; no less than eight factories entered the 2016 event, while Porsche provided the most cars at 37. With approximately 250,000 people watching the 159 strong multi-class field (ranging from full-blown GT3s to Renault Clios and Opel Mantas, the manufacturers are ever more interested in harnessing the event - creating ever more competition and performance. All tickets have access to the grandstands and paddock area. Children under 12 years of age will receive a 50% discount on the ticket price. Car parking tickets available at £19 per day. Enjoy an outstanding view of the Start / Finish straight and the pit lane from the Rheinland Lounge above the BMW M Power Stand. The private balcony offerrs an unrivalled racing experience together with fine cuisine and first class service.